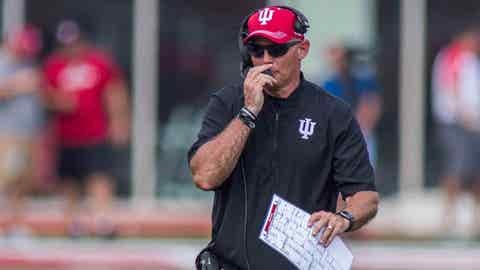 Indiana coach Tom Allen could have been upset after watching his defense allow 49 points last weekend at No. 3 Ohio State. Instead, Allen saw encouraging signs on tape. The Hoosiers forced three turnovers, consistently pressured quarterback Dwayne Haskins Jr. and slowed down the Buckeyes’ vaunted ground game — a solid performance from a young, improving group of players who have often been overshadowed by the Hoosiers’ usually high-scoring offense in previous seasons. Make no mistake: Allen’s preference would have been to cut that point total at least in half. But the reality was Indiana (4-2, 1-2 Big Ten) held Ohio State to its season average, kept the Hoosiers within striking distance through three quarters and demonstrated their defense possesses some key cornerstones against one of the nation’s top teams. At the midway point of this season, the Hoosiers have a league-high 13 takeaways — matching their 12-game total from 2017. The Hoosiers aren’t just getting better as a unit, either.